Over 3 million taught since 1998! Most guitar lesson sites force beginners to do boring exercises and drills for months before actually making music. If you’re a beginner at Guitar Tricks you will be making music on day 1, with our beginner Core Learning System. Every time you learn something new it is immediately put into a musical context to make it more fun! You will be playing simple songs from the beginning. 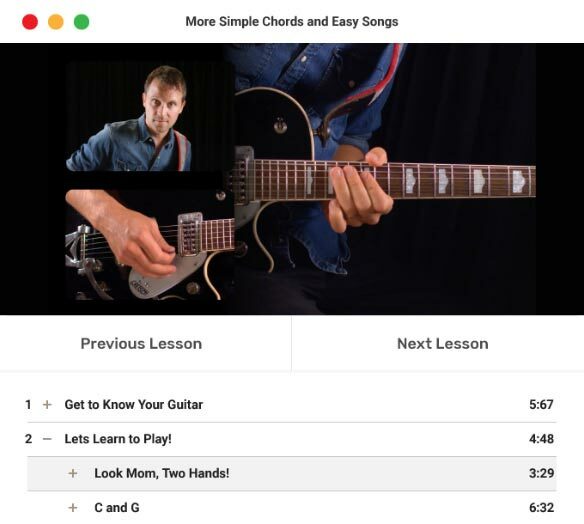 Forget the old days of endlessly searching through YouTube videos and guitar tabs, learning guitar is easier and faster with our step-by-step system. Our number one goal is to make you a better guitar player, and we will never give up on you! This means we have instructors, a guitar tech and a friendly staff that’s dedicated to helping you on the guitar journey. If you ever need it, you can book a 1 on 1 private video lesson with an instructor for extra help or a spot in a group session with an instructor and other students just like you. Guitar Tricks has lessons for nearly every popular song you can think of, with more added every week! Picking up a guitar and making beautiful music is a great feeling and a big accomplishment. Sadly, most people believe they will never learn how to play. That’s why we started Guitar Tricks® – to provide online guitar lessons for those searching for an easy, fast, and fun way to learn guitar. There are different ways people have tried and failed to learn guitar. In-person instructors and YouTube seem like great options at first, but they usually lead to slow progress and staggered results. It’s impossible to achieve your guitar goals with wannabe celebrity instructors, or searching through hundreds of broken lesson videos. At Guitar Tricks®, we’ll give you all the guitar knowledge you need to succeed with our award-winning, step-by-step curriculum. Guitar Tricks® invented online guitar lessons in 1998, and has grown its comprehensive lesson library to over 11,000 lessons, and over 600+ songs, with top-notch instructors from all over the world. You’ll feel confident learning with our easy-to-follow lessons that build on your skills slowly, so you move on to the next level with ease. The best part is that Guitar Tricks® has lessons for everyone, whether you’re an absolute beginner learning guitar or an advanced guitar player looking to improve your technique. With lessons that teach you from the ground up, covering every genre of guitar, you won’t get bored or lost with repetitive lessons. At Guitar Tricks® you can jump right into playing your favorite songs by artists like The Beatles, The Rolling Stones, Eagles and tons of other popular artists.